It's redwork, but without any farmyard animals or bonnets. And worked in more than just red thread. So not technically redwork, but inspired by it. Traditional redwork has its origins in the middle and lower classes, rather than the more expensive silk and linen embroidery that only the wealthy upper classes could afford. And although it originated in Europe, it became really popular in America as penny squares - simple designs printed on to a square of fabric and sold for 1p. They were used to make bed covers, quilts and other household items and this type of embroidery was dubbed redwork after the red cotton thread used to embroider the designs, which was made using a natural dye called Turkey red. 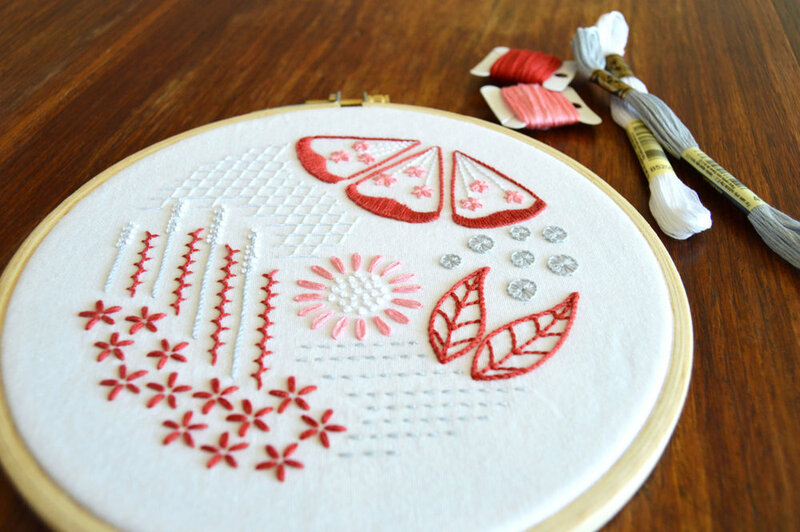 French knots and running, back, blanket and stem stitch are the most commonly used stitches in traditional redwork embroidery, along with lazy daisies made up of detached chain stitches. Mock Redwork uses variations on these stitches or reproduces the look and feel of them with alternative stitches not usually associated with redwork. Designs were fairly naive line drawings and generally reflected everyday life. Farmyard animals, kitchenalia, nature and young children featured heavily. In keeping with this, Mock Redwork draws on the traditional nature theme but in a more abstract and contemporary way. And the addition of extra colours adds another modern twist to this age-old style of embroidery. Mock Redwork, the third in the Mock range, is available as a PDF pattern on Etsy and Craftsy.